and export more raw sugar to take advantage of cheaper freight costs. Very few sugar refineries are making profit which will force a reduction in production resulting in increased premiums for white sugar in the latter part of 2015. Global stocks after a 4 year surplus, will require more than a season of slowing production to see a deficit in sugar stocks. As predicted in our September report, the UK beet farmers have produced a bumper harvest which has been supported with good extraction rates at all four beet processing refineries. The UK sugar production is estimated to reach 1.4 mln tonnes, compared with 1.32 mln tonnes in 2014. Although the sugar content in the beet is lower this year, the extraction rates have improved. An excess stock of sugar has resulted in growers receiving a reduction in the beet price from £31.67 per tonne for this season’s crop to £24 per tonne for the 2015/16 harvest. As well as a reduction in price British Sugar has requested that contracted beet tonnage with the famers is reduced by 20% for 2015/16 until the end of the EU sugar quotas in 2017. Throughout Northern Europe the beet lifting and processing is going extremely well, resilient to frosts and heavy rains. 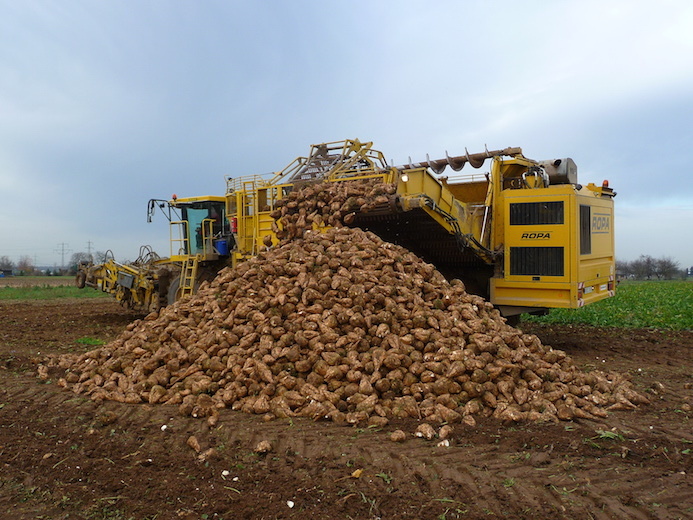 Production estimates for 2014/15 EU beet campaign remain at 18.3 million tonnes, depending on weather conditions for the remainder of the campaign. The large supply of over quota sugar will result in more sales to the chemical, yeast and ethanol sectors and carry over into the 2015/16 season. The EU price for refined sugar is now at its lowest point since July 2006. In Russia the devaluation in the rouble has made imports more expensive, so domestic producers have increased their prices by 40%. The harvest in Brazil which began in April 2014 has come to an end after crushing 564 mln tonnes of cane, producing 31.8 mln tonnes of sugar, down 2.4 mln tonnes on 2013/14. The drought during the crushing season reduced agricultural yields, but improved the sucrose content in the cane. The diversion of cane to sugar reduced to 43.2% due to a significant premium for ethanol sales over sugar for export. This could be repeated in 2015/16 if the ethanol/gasoline blend is increased before April, however low global oil prices coupled with low bunker prices have weakened the depressed global freight market, which could increase the demand for Brazilian raw sugar, as buyers capitalise on cheap freight. The above average rainfall in December will help the 2015/16 crop, although dry weather from January to April would offset any gains in December and increase the raw sugar price for Q4 in 2015. Twenty per cent of Brazil’s cane mills are now mothballed a direct result of the world having too much quality sugar both at source and final destination. After a delayed start to crushing in November, favourable weather has enabled all the 50 mills to start producing sugar. The dry weather in 2014 has resulted in sugar yields being down, with a forecast of 10.1 mln tonnes of sugar to be produced, compared to 11 mln tonnes in 2014/15. Due to current low prices Thailand may store sugar and wait until higher market prices at the year-end before releasing further exports after initial shipments to China and the Gulf. An early start to the harvest in October, improved sucrose recovery and an increase in planted area has resulted in a 20% increase in sugar produced compared to last season. The estimates for the 2014/15 crop remain at 25.5 mln tonnes of sugar produced. There remains uncertainty on the level of government subsidy for exported raw sugar and with the crushing nearing the half way point, time is running out for significant exports of around 1.0 mln tonnes to leave the country. The predicted drier than normal weather could affect the 2015/16 crop. The 2014/15 harvest produced 4.4 mln tonnes of sugar and the estimates for the 2015/16 crop are currently down at 4.3 mln tonnes. The anti-dumping dispute between the US and Mexico has softened with an agreement to suspend free trade and establish quotas and minimum pricing. The refiners and other interested parties may not be satisfied with the outcome, so further disputes and investigations into anti-dumping may continue. The Mexican harvest has started with much better sugar yields being reported. Overall sugar produced is estimated to be close to last year’s 6.0 mln tonnes. Domestic sugar prices remain low despite a smaller than expected crop, estimated at 12.8 mln tonnes. Sugar from Thailand will continue despite government controls on imports and will remain above the WTO minimum figure.